LG G6 vs LG E6 review: which is the best 4K OLED TV? | What Hi-Fi? LG G6 vs LG E6 review: which is the best 4K OLED TV? LG has made the OLED TV market its own over the last 12 months. While Sony and more recently Panasonic have both dipped a toe into the crystal clear OLED waters, LG dived in head first. And with impressive results. There are four ranges in LG's 2016 OLED line-up: the entry-level B6, the C6, the E6 and the flagship G6. Three LG OLED TVs have passed through the What Hi-Fi? 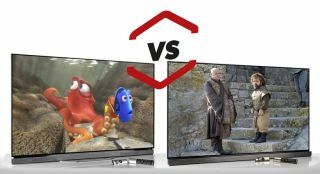 test rooms this year, and all three have come away with glowing reviews: the £3000 LG OLED55C6V, the £5000 LG OLED65E6V and the £6000 LG OLED65G6V.